Well, I'm packing my bags... but leaving my hubby and daughter at home. Off to Kentucky to go see my Mom. 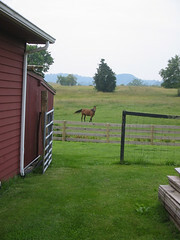 (The photo is her and my stepdad's horse... Punch. ) It is SO pretty down there! Believe it or not... I WILL be packing my sewing machine and a few things.. even though I'll only be there for 3 days. I'd rather have them with me in case I get the itch (HIGHLY possible!) than have the need to create and not be able to. I'll "see you" when I get back... have a great weekend! Wow what a week! It just flew by.... and it appears that I did not get any bears done. Well... I did.... but they were special orders. I have gotten a couple of suggestions in my "suggestion box" (which is near the bottom of the Bears 4 Adoption page) so they will be coming up soon! 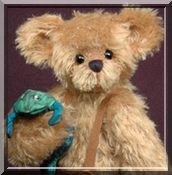 There is a request for some more mini bears.... and also for some 2 toned bears.... so keep watching and you can see their progess here! Chippy is one of my "Pocket Bears"... little 6" bears without pawpads. 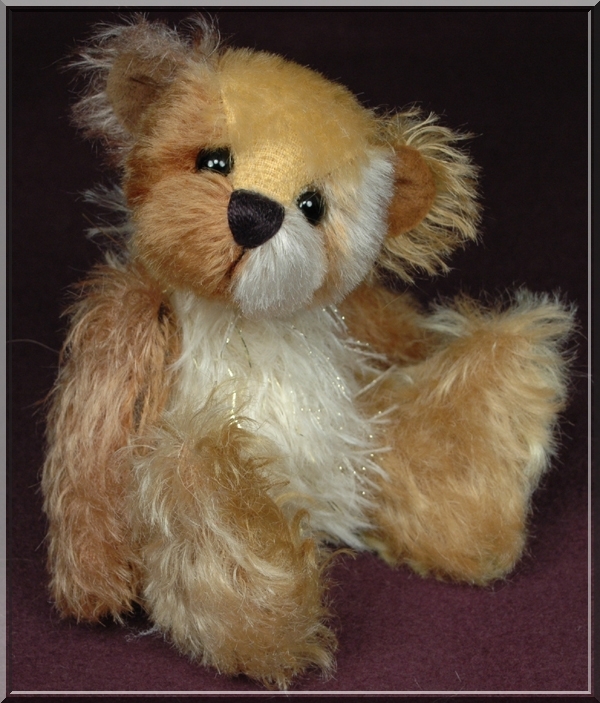 He is also part of the "Patchwork Bears" as he was created from all different colors and types of mohair. I am SO bad with flowers! I mean, I LOVE them.... but after a month I seem to "forget" to water them ... like when it is REALLY hot... and of course they all die. I decided last year that I was just not a gardener. I might try perenials.... since they don't need DAILY care. Well, maybe for the first month... but I could do that LOL! Well, then the flowers start to arrive in the stores.... AND.... I've been talking with my friend Daphne of Back Road Bears in New Hampshire... and she's told me about the TONS of flowers and plants she's been planting! (which, by the way... 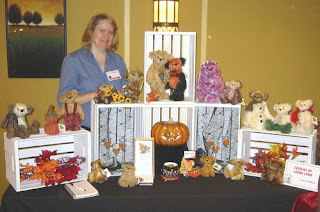 I can't wait to see in person in August when I go there for the 2nd Annual Maine Teddy Bear Show! So...... 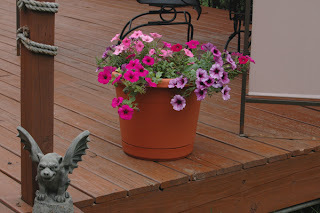 I got one large plastic pot - for my petunias for the sunny back deck. 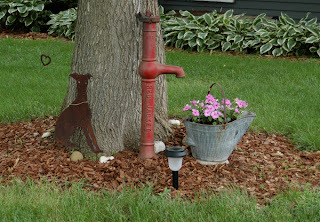 I figure the plastic will certainly help keep them from drying out... and the fact that the pot is large will help too. I'll let ya know later in the year if these have survived LOL!!! 2007 Show Schedule finally updated! I've finally updated my 2007 Teddy Bear Show schedule! You probably thought ... if you have looked at my shows page at all this year... that I wasn't going to do any shows in 2007. Well... actually I'll be doing THREE! More info can be found here. I'd LOVE to meet you if you are able to go!